BJ's such a small guy... and for such a small guy, he sure takes up a lot of room in this house. Actually, you can't really call the establishment we live in a "house". We live in a small one bedroom cottage, which I should say I'm thankful for living in because the rent is amazingly cheap. Anyway, when it was just me and HJ, I could actually walk around with some comfort. Now, we have so many baby items that I feel like I'm sinking deeper and deeper in a sea of baby clutter. The picture above is what prompted me to write this blog... HJ was sleeping, so he had the couch reclined back, and I had to step over him to go into kitchen. Lots and lots of STUFF. We have a bouncer, a walker, a swing, a rocking chair, a co-sleeper, a bassinet, a baby clothes cabinet, and lots and lots of stuffed animals. :-) In fact, I have so much furniture that I had to take some to my parents' house! Lucky for me, my mom puts BJ's stuff in my old room... but I doubt my dad is happy about my old room becoming a storage facility. Oh well, hehe. 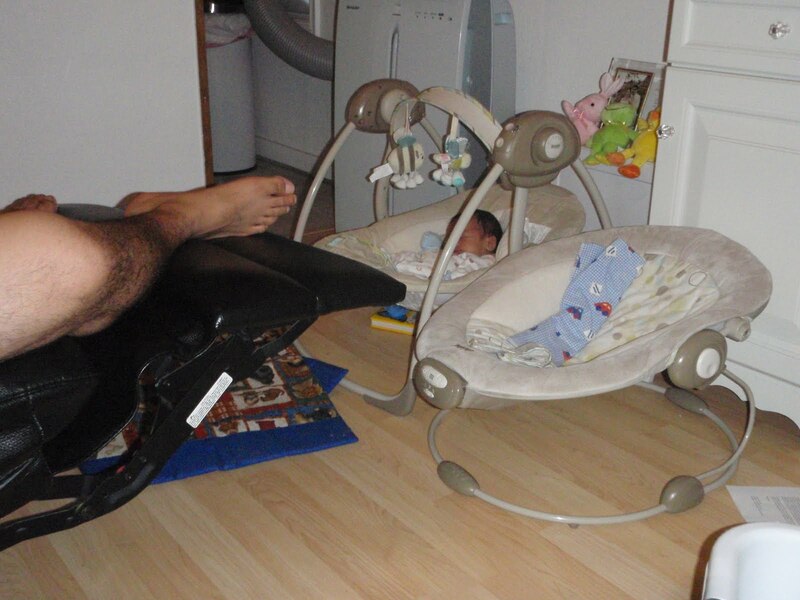 The swing is the best baby furniture ever invented. 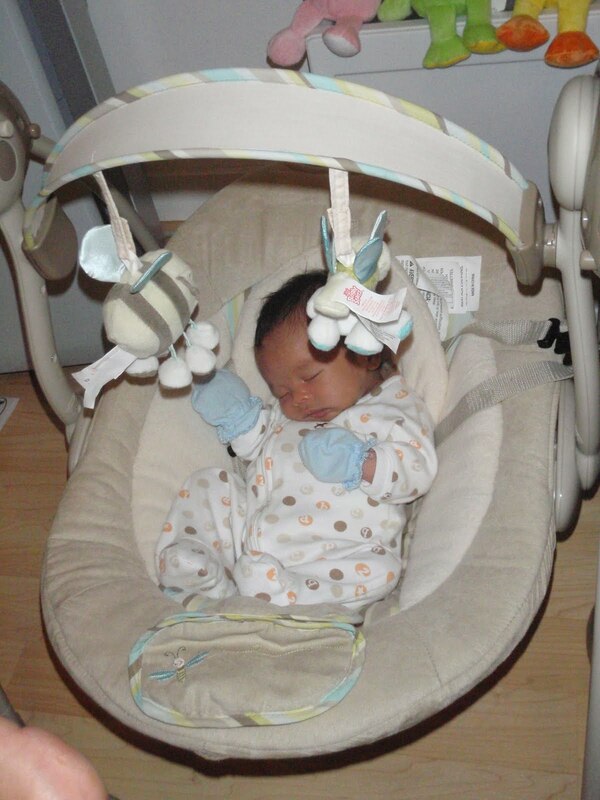 BJ has been sleeping in his swing for a whole 3 hours now without stirring! It's an amazing contraption. In fact, I seriously question what I am doing awake at this hour... I should be sleeping since I know he will be out like a light. This swing adjusts for BJ's weight and swings according to how heavy he is. Before we received this swing, BJ would wake up every two hours, sometimes every hour. I can't speak for him, but I think the movement soothes him and he feels like someone is holding him. Whatever the case may be, he's ASLEEP... and I will sleep now too so I can catch some rest. Good night baby readers! Those swings are amazing things! I've seen their magic being worked before, and I was in awe. Hope you got some good sleep! Habebi - Thank you!! It really is amazing. I watched BJ fall asleep before my very eyes... before, he would always have to be held to fall asleep. I'm in SHOCK. I have my kids Modern Baby Cribs but I like your swing too seems my kids really feel the abundance of life in his infancy. Have to Keep This Up - For Jacob!